USDJPY is under the influence of Revised Industrial Production m/m in Japan and the Federal Budget Balance, Beige Book, 30-y Bond Auction, Crude Oil Inventories, and Import Prices m/m in the US. 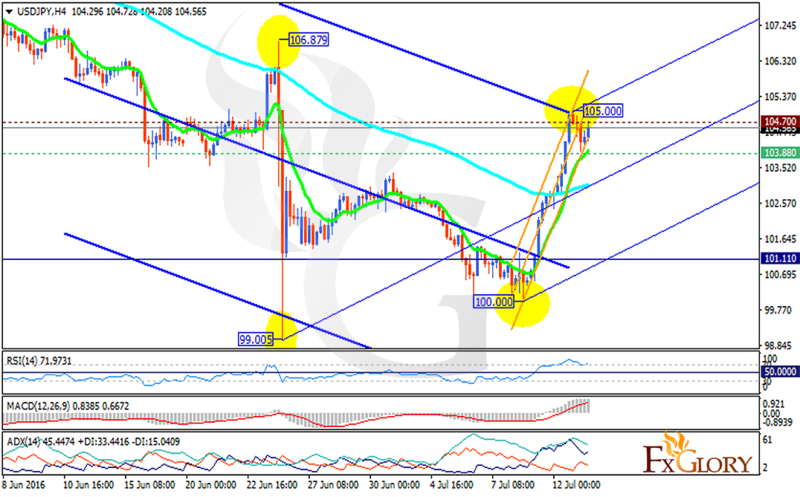 Yesterday after hitting the 105.00 level USDJPY fell but today it is rising again. The support rests at 103.880 with resistance at 104.700 which both lines are above the weekly pivot point at 101.110. The EMA of 10 is moving with bullish bias and has already passed the EMA of 100. The RSI is moving in the overbought area, the MACD indicator is in positive territory and the ADX is showing strong buyers. USDJPY upward continues until it reaches 106.